A number of studies have shown that a large proportion of commuters want to bike to work but hesitate to do so for lack of a safe route to follow. I have an open offer to scope out a safe bike route to anyone within the national capital region. 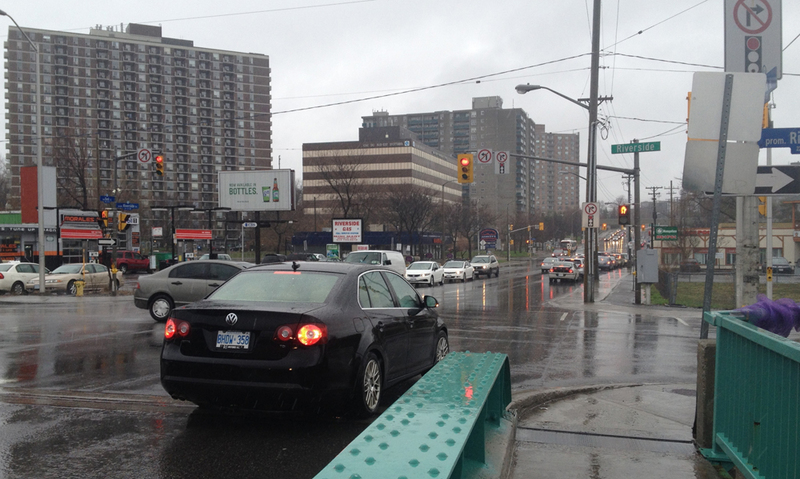 All I need is two cross streets – one to start from and a final destination. 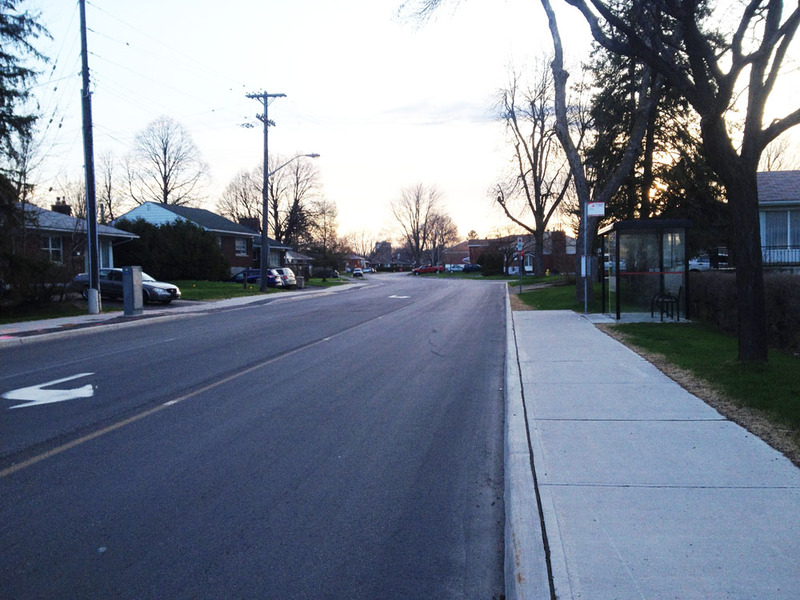 Halden took me up on my offer, starting from the intersection of Woodroffe and Iris at the edge of the Kenson Park neighbourhood in the west end, to the intersection of Vanier Parkway and Coventry Road in the Overbrook neighbourhood. He’s already a regular bike commuter but thought it would be interesting to see the route I scope out compared to his. Me too! Here’s what I came up with. The Blue line is the one I recommend- a very picturesque route almost entirely along bike paths. 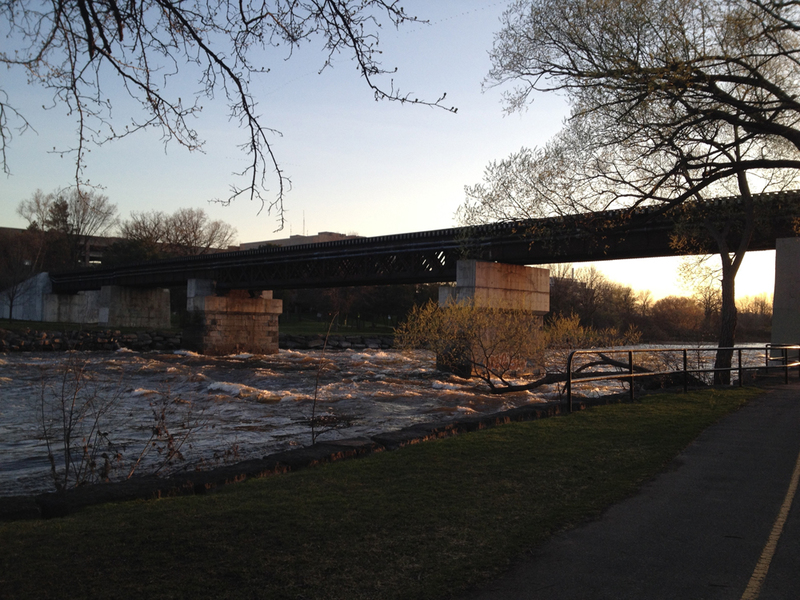 The red line is a short cut that shaves 15 minutes off but traverses the not-so-safe Bank Street Bridge over the Rideau River. More about that later. The green line shows the route Halden takes. 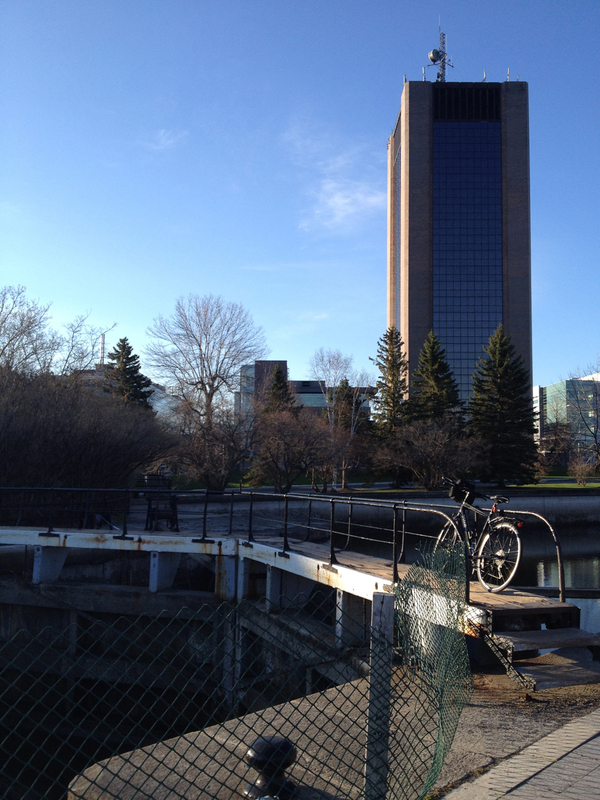 After crossing the locks at Carleton he rides along the canal and cuts over to the Rideau River along Graham Avenue, Lees Avenue, then through the Ottawa U Lees campus. Lees is a pretty busy road so one’s comfort level with riding in traffic would be an important factor in choosing this route. And away we go! First I headed east on Iris. Nice quiet street. Easy on the Iris. 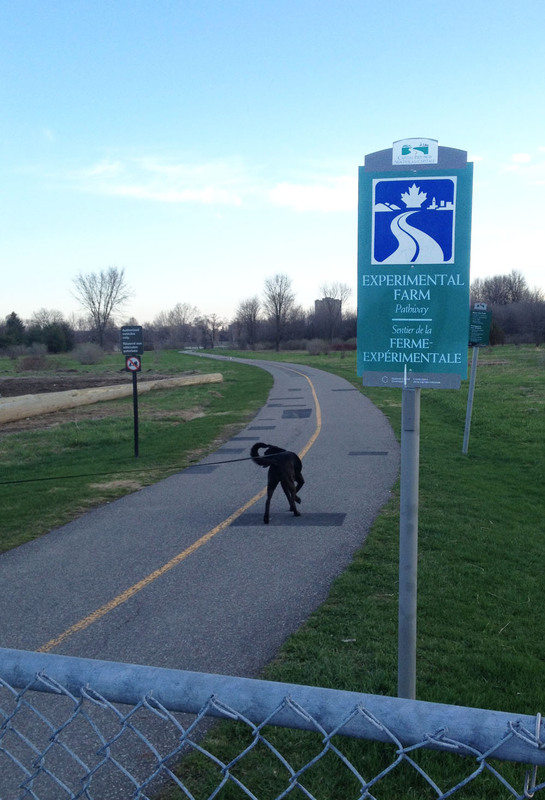 The Experimental Farm Pathway crosses Iris. I got on the path and continued eastwardly. 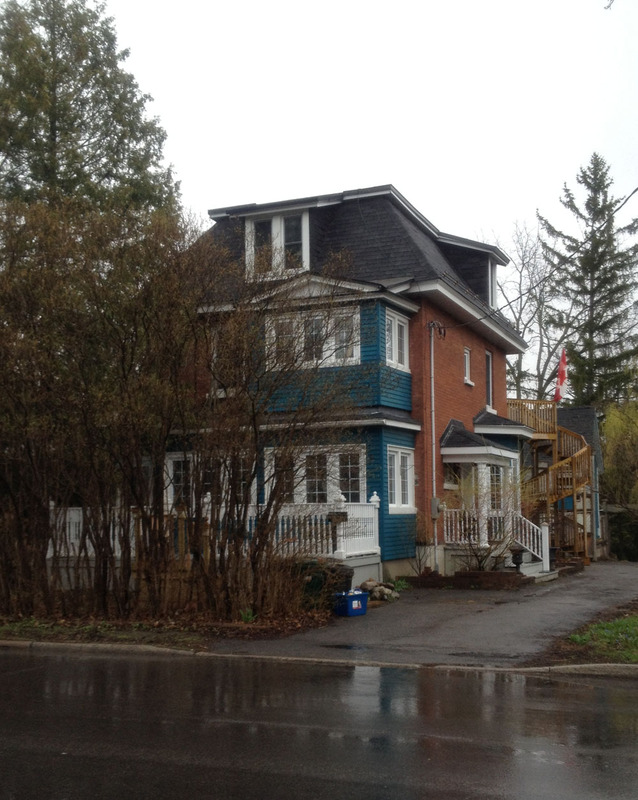 This interesting building is located just south of where the path crosses Maitland. 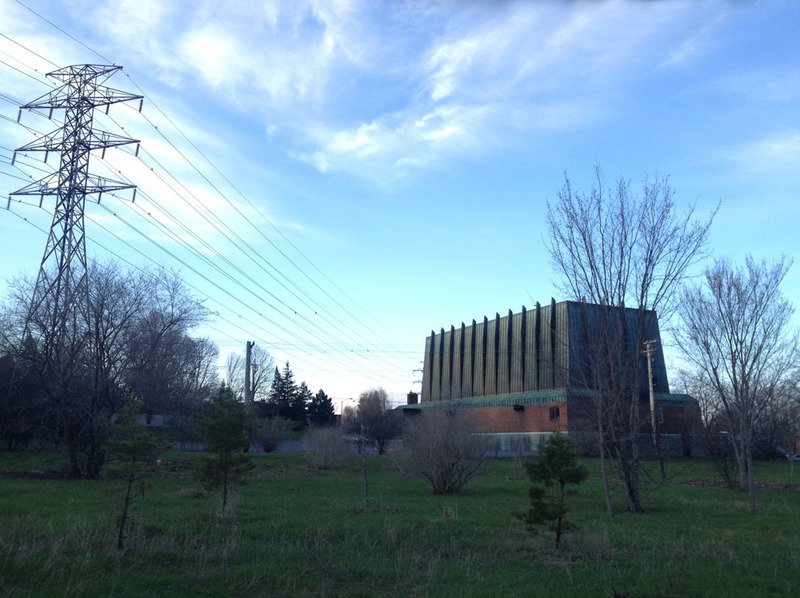 I used to think it was some sort of power station associated with the hydro towers that ran past it. Well it is a power station but of a very different sort. It’s the Trinity United Church designed by the late Ottawa architect James Strutt. The path winds up and over Carlington Heights, then down through the farm. Branches budding on the edge of the farm. Things get a little screwy where the path meets Fisher. To continue along the path on the other side requires riding south along Fisher for a hundred yards or so and crossing at the lights, like so. 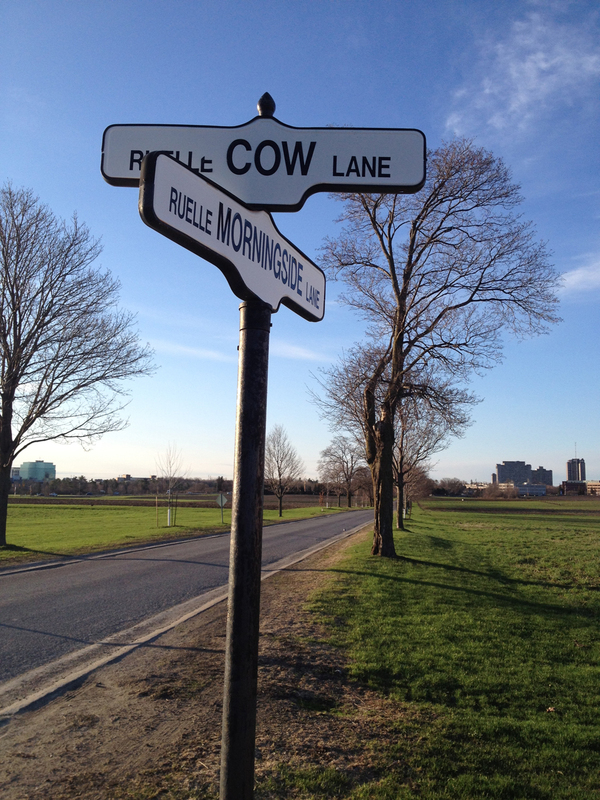 The path becomes Cow Lane, and then turns right on Morningside Lane. 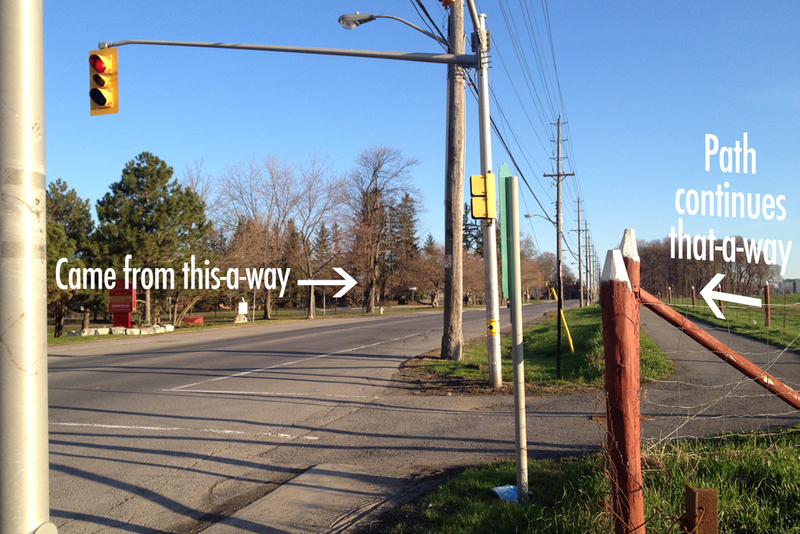 Midway down Morningside Lane there is a small road on your left that takes you to an intersection with traffic lights across Prince of Wales Drive. The path continues along the road on the other side of Prince of Wales, and ends by the canal locks across from Carleton U. I pushed my bikes over the top set of locks. On the other side of the canal I followed the path to the right (blue arrow). 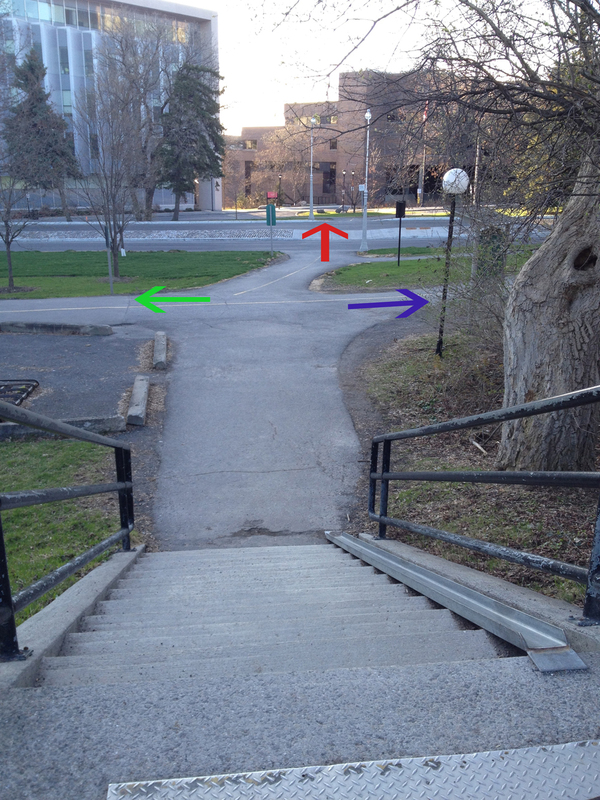 The red arrow is the way you’d go for the alternative route on the above map across the Carleton campus and Bronson, through Ottawa South and across the dreaded Bank St Bridge. The green arrow points is the direction Halden takes. 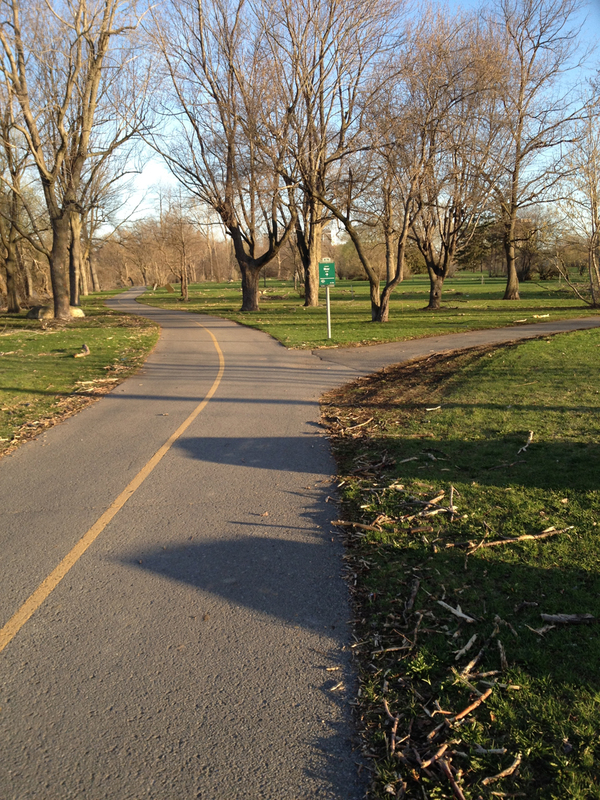 The path pops out at Mooney’s Bay and crosses over the river. On the other side of the bridge the path dipsy-do’s back under the road. 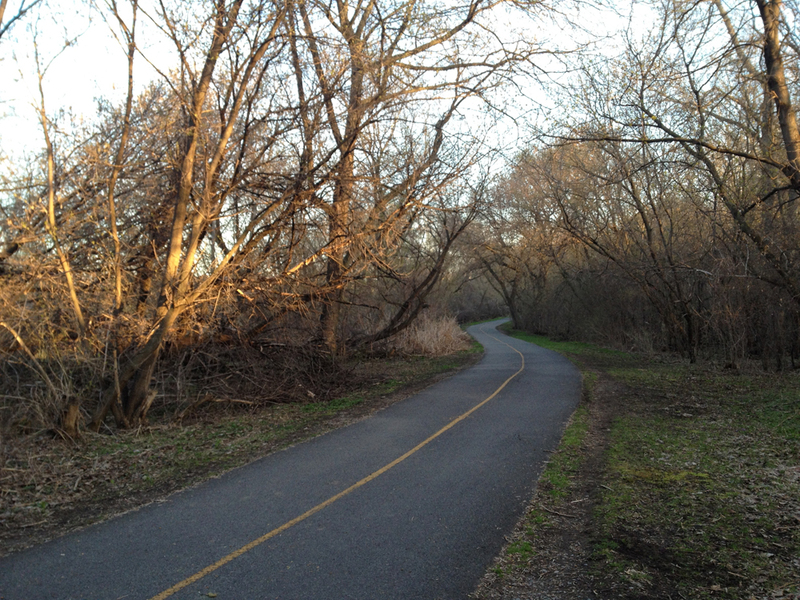 The scenery is quite spectacular all the way down along the path through Vincent Massey Park. 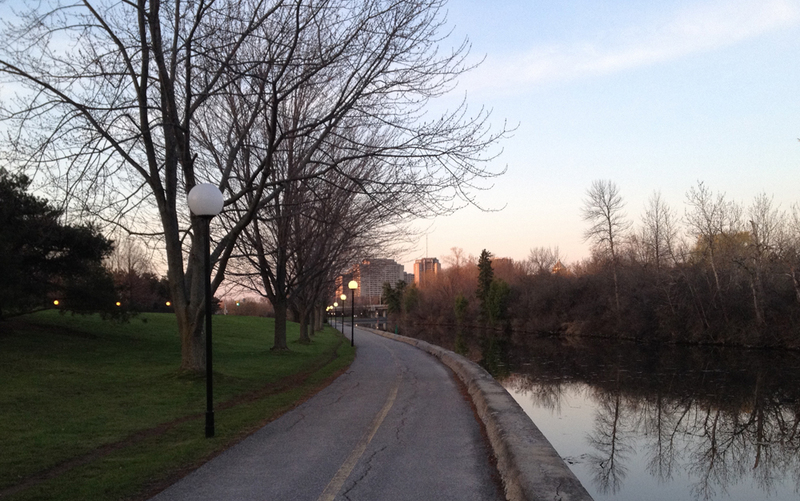 This path is called the Rideau River Eastern Pathway which I followed almost entirely to our final destination. 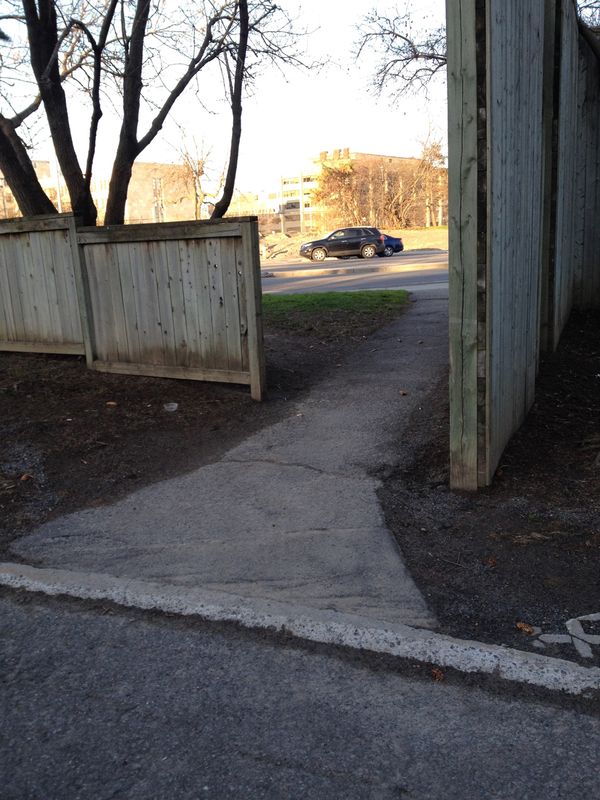 It is a very pleasant path however there is one dangerous spot, and that’s the intersection of Bank St and the pathway/Riverside Drive. 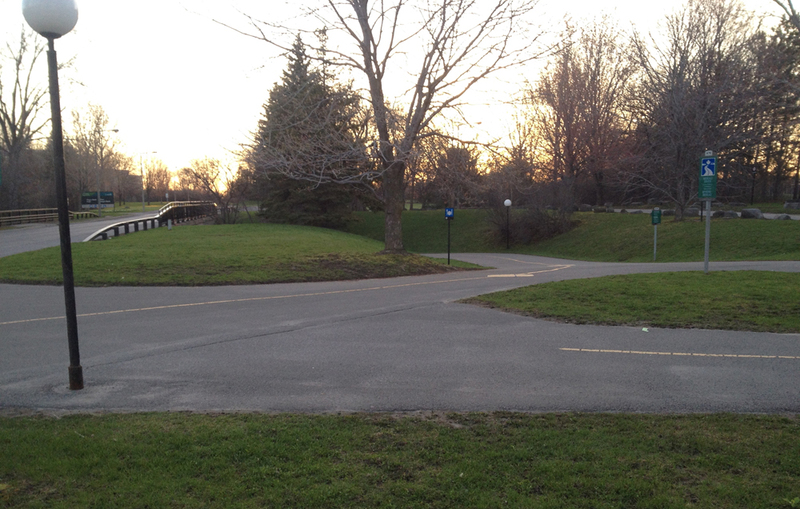 Riverside Drive is a four lane speedway. Cars crossing the Bank St Bridge heading south often try to hurriedly turn right onto Riverside on the red without looking to their right, regardless of the sign. As such they threaten cyclists and pedestrians on the path as they nervously try to rush around the corner, for example this car at the intersection this Sunday that came to a screeching halt well over the stop line. 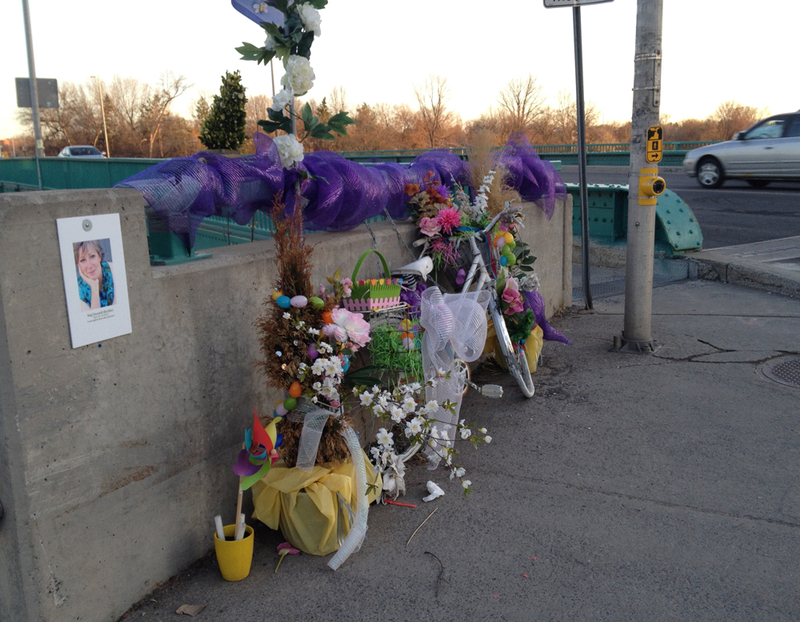 The ghost bike at this same corner is a commemoration to Meg Dussault who was struck and killed by a cement truck in July 2013. 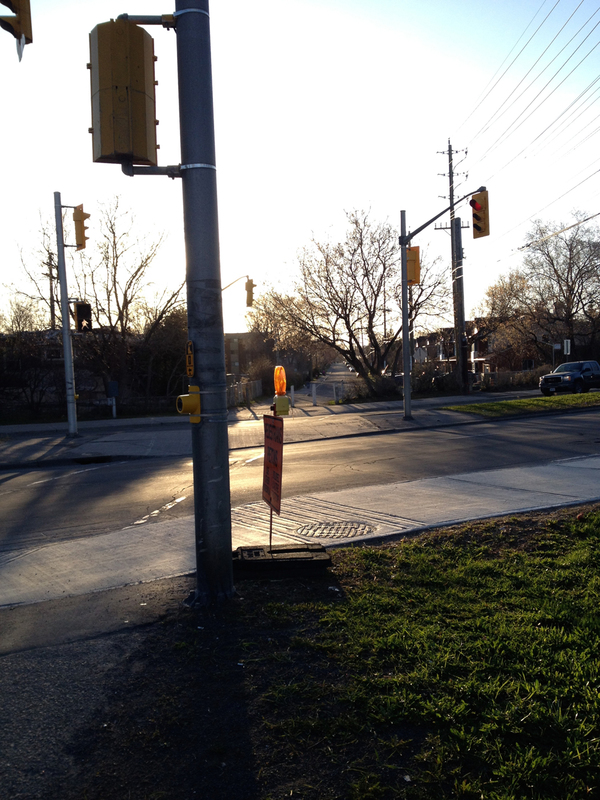 UPDATE: May 2016 – The ghost bike has been removed by the city. On the secondary route option suggested by the red line, crossing the bridge is what is proposed. There are sharrows painted on the road, suggesting cyclists share the road. This Muddy Bike post (click here) shows that this is an ineffective option, and I believe a dangerous one as it suggests this is a safe area for cyclists when it is quite the opposite. So, when my son and I biked to Billings Bridge Museum on Sunday we walked our bike on the sidewalk. So, what to do once you get to the corner? I don’t move until I am sure the driver stopped at the corner sees me and seems aware that I have the right of way to cross. OK, enough on the dangerous bridge, time to continue down the pathway. 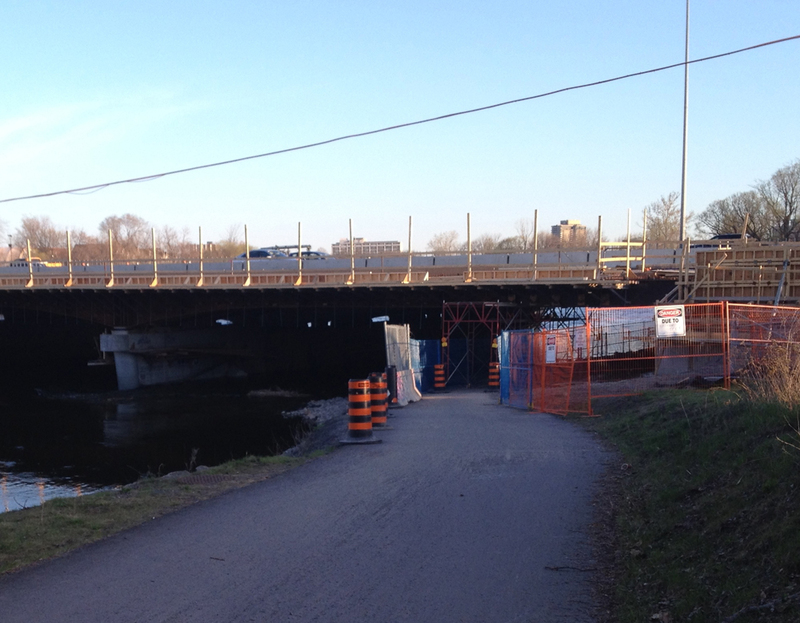 They’ve re-opened the path under the Queensway where they are doing construction, but it’s through scaffolding and only wide enough for one bike so I went pretty slow in case a rider was coming the other way, giving me time to react. Getting close to our destination, I turned off the path at the sign pointing to River Road. 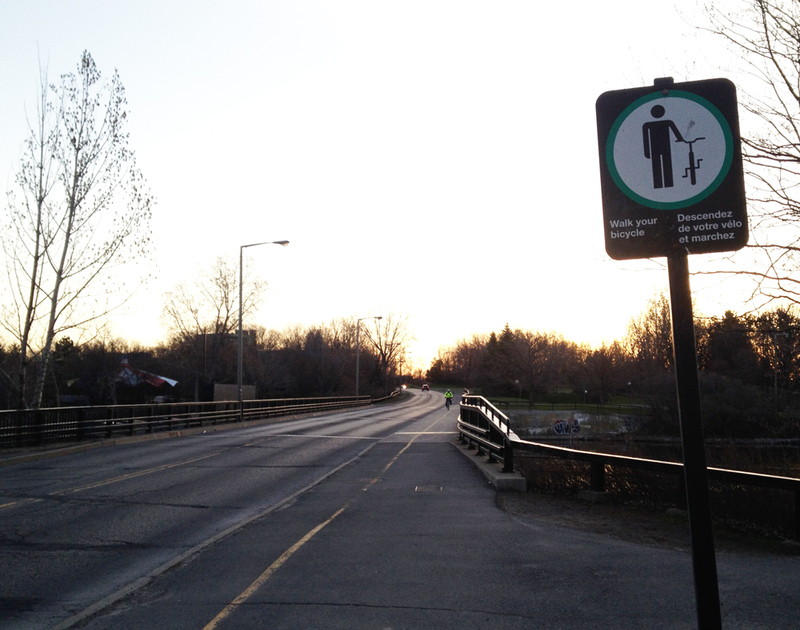 I turned right off River Road onto Presland, and was pleased as punch to discover a pedestrian cross signal to get across the Vanier Parkway. 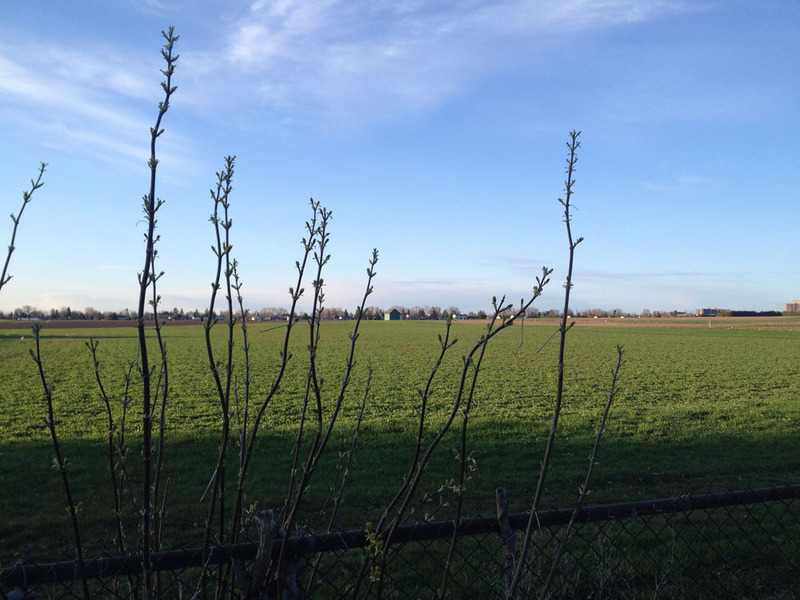 I continued along Presland for a jot until I turned right onto Forestlane. Part way down Forestlane there’s a small opening that allows you to pop out almost right at our final destination. 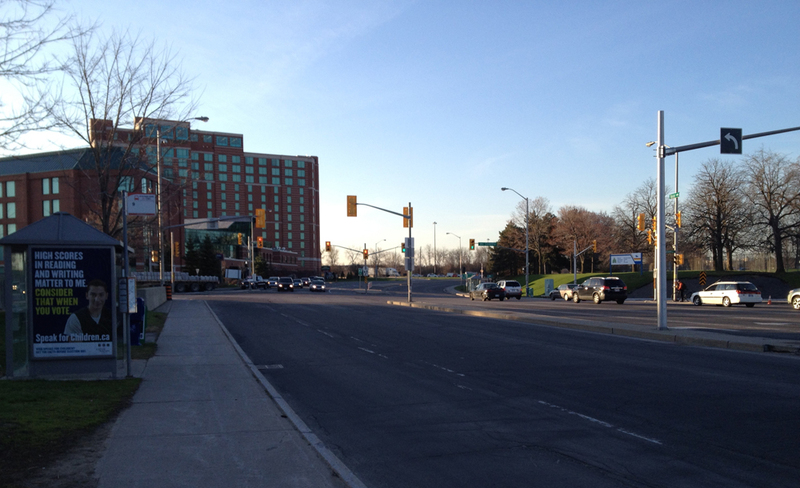 And There it is – the intersection of Vanier Parkway and Coventry Road! 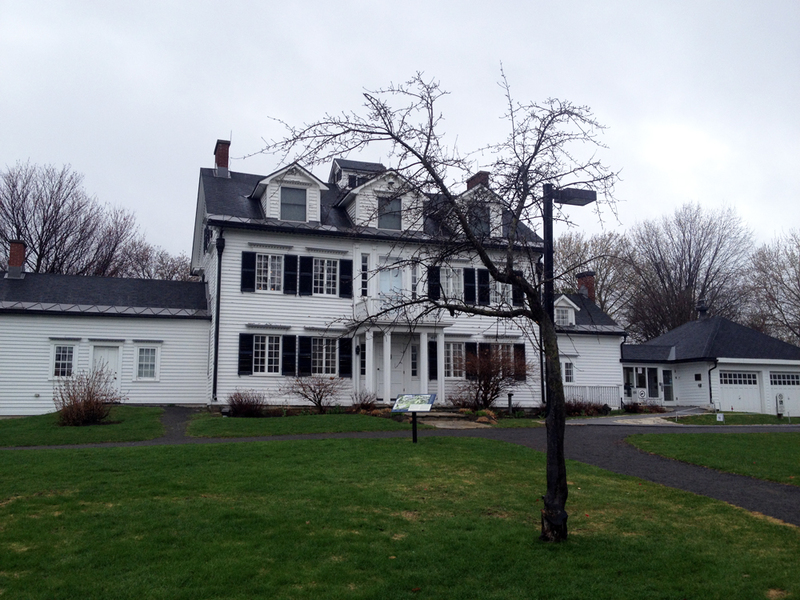 I was scanning through the great selection of tours included in this year’s Jane’s Walk program when one in particular caught my eye: A bike tour of the Billings Estate National Historic Site. I decided to check it out. The wet weather forecast must have discouraged others from attending, which resulted in a small entourage of four including our guide Britta, who shared an enthusiasm and passion for local history that made the continuous rainfall barely noticeable. She is an employee at the museum and helped put this bike tour together, which will be given again throughout the summer. Call the museum to confirm if you are interested. You may even be able to request a group tour. 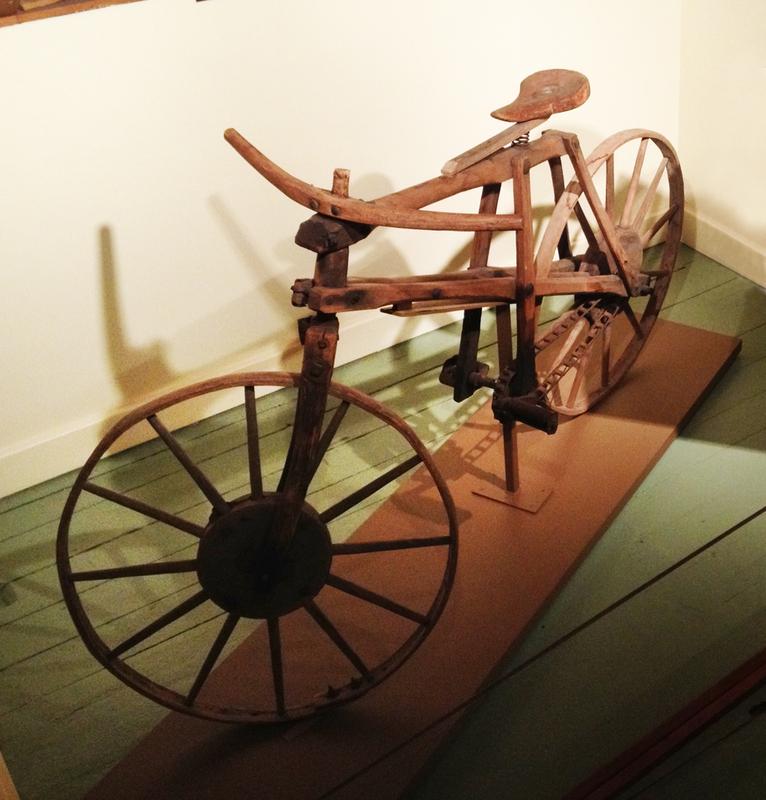 Billings Estate Museum is bike keen! Not only did they organize this outing, check out this wooden bike in their collection. It was hand built by a 17 year old farm boy named James Henry Blair back in 1898. 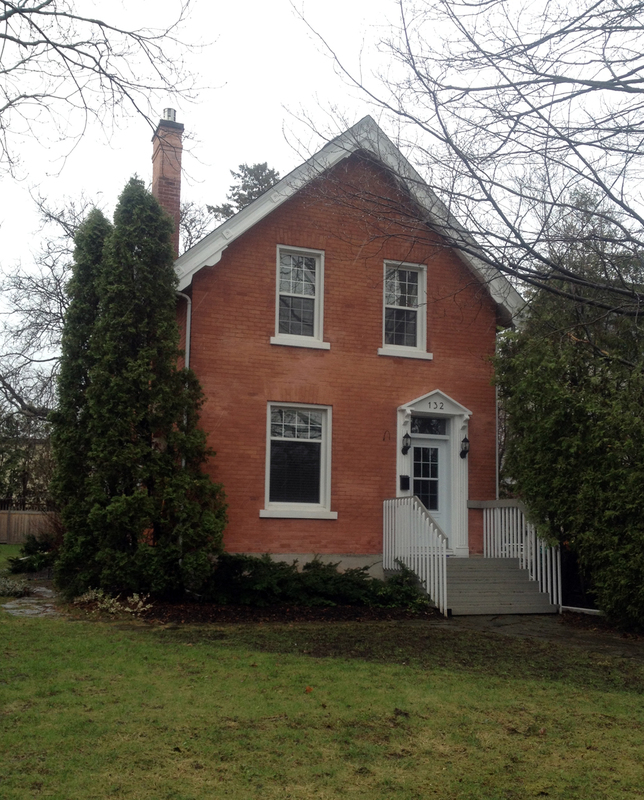 The story of the Billings Bridge Community follows the gradual dividing up of the homestead originally settled by Braddish Billings and his wife Larima way back in 1813, thirteen years before the establishment of Bytown. 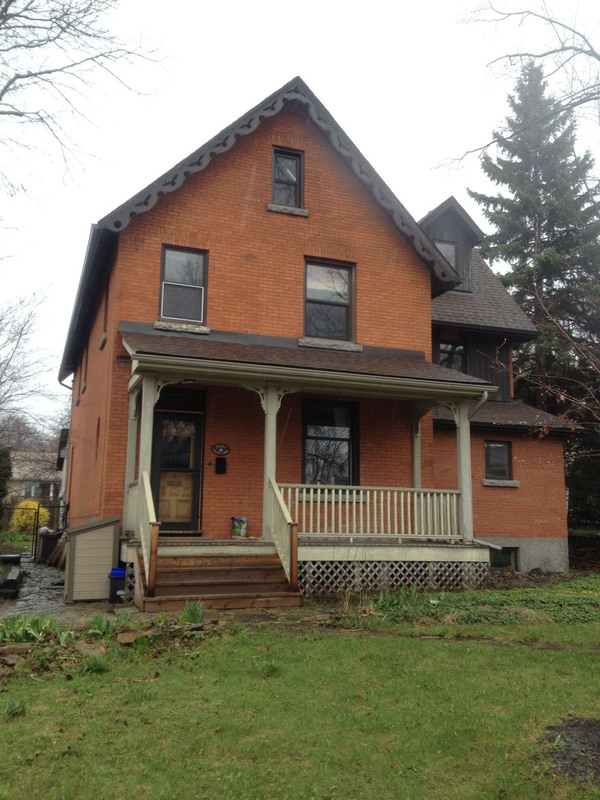 The tour visits a number of locations and houses spread throughout the community, starting from the Billings House which is presently a museum. There isn’t a self guided program specifically for this tour, but there is a booklet sold at the museum for a few dollars titled Historic Homes and Buildings of the Billings Bridge Community that share a number of the stops, which I’ve identified on the following tour map. There were a number of other interpretive stops along the way not identified on the map. The Foreman’s House circa 1823. 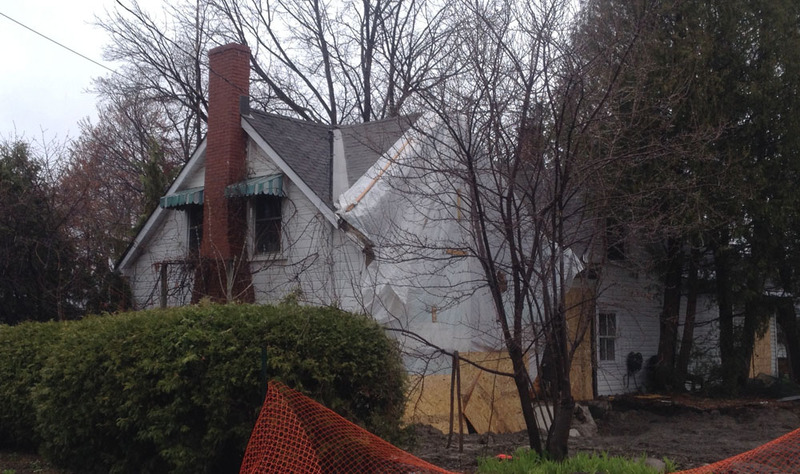 Protected as they build on adjacent lot. On the last day of this year’s 30 Days of Biking I decided to take my winter wheeler in for a well deserved tune up. Upon my arrival I wasn’t surprised to learn they had a back log. At this time of year everyone is anxious to shake the dust off their summer steeds and ride! So I made an appointment and pedalled back home. I’m very pleased I took the 30 Days of Biking pledge. It allowed me to focus on the importance of biking to accommodate short daily tasks as well as longer commuter routes. I probably won’t be blogging as often as I have been over the last month, but I do intend on continuing to find a daily reason to go for a ride. 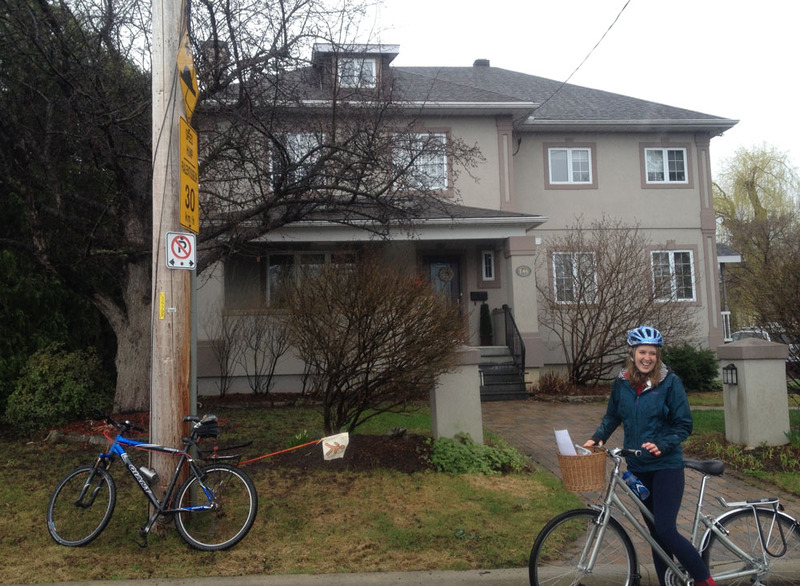 To get to the bike shop and back I followed my favourite Westboro-ly route, described in detail in this post. Here are a few additional hi-lites to add to its appeal. 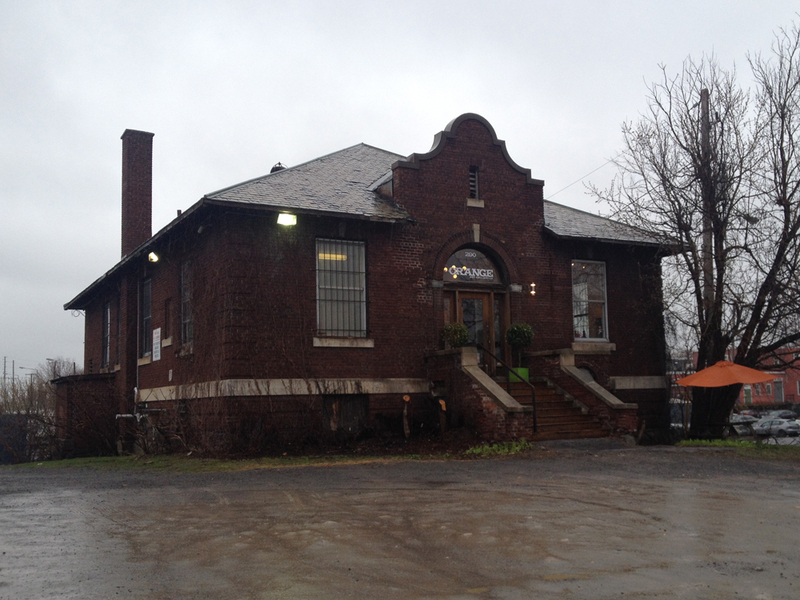 Orange Art Gallery has recently taken up residence in this great little old building that sits on the edge of the City Centre parking lot on the way to and from the O-Train path. 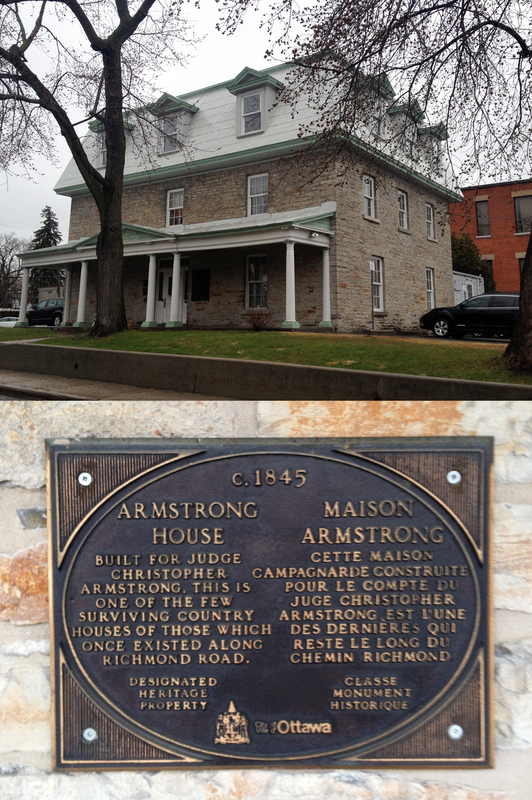 This well preserved heritage building also stands proud on Armstrong, one block north of Wellington. 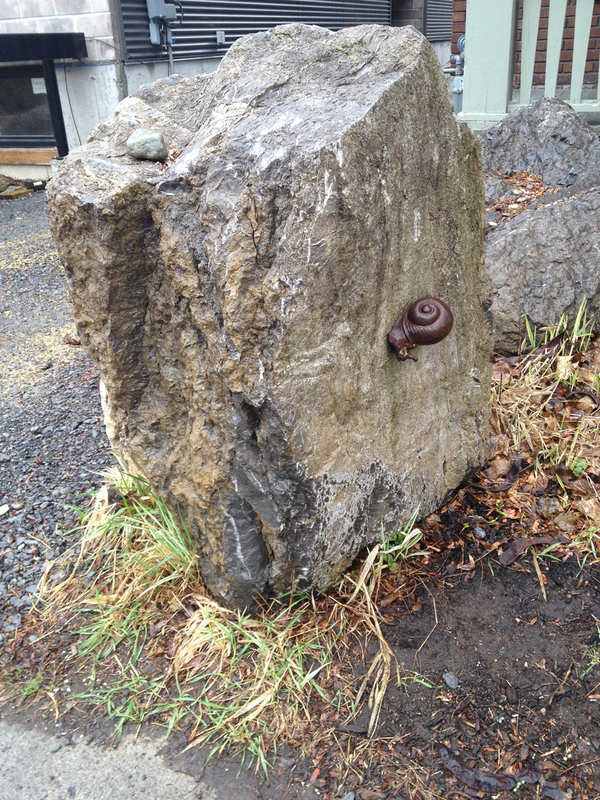 Big rocks on front yards can be interesting, even more so with iron snails crawling verrrry slowwwwly across their surface, like this one along Armstrong closer to Parkdale. So there you have it. ‘Twas a fine month of riding!